Learn about and travel the Philippines. Philippines vacations cheaper, better and more fun! The Philippines is blessed with many natural wonders. With tropical climate and lush vegetations, this archipelago is a destination you’ll never forget. 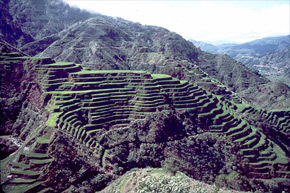 One of Philippines pride is the beautiful Banaue Rice Terraces. These man-made rice paddies were constructed about 2,000 years ago. The original Ifugao’s used their bare hands to build the stone walled mountain, one stone at a time. This magnificent landscape is the main tourist attraction in Banaue. They have a lot of tourists who go out there to go trekking too. It’s perfect for hiking because of the slopes and the narrow rugged trails. The carved out mountains looked like stairways going up the sky. It goes up to 4,900 feet high. It was said that if you put the steps side by side, from end to end, it would wrap halfway across the globe. It is truly a work of art, no wonder it was named as the 8th wonder of the World. The lands are still being used today to plant their crops. The Ifugao’s only use organic fertilizers and natural pesticides gathered from the neighboring forest, just like their ancestors did many, many years ago. Some areas of the rice terraces are showing signs of erosion. It needs maintenance. Some of the new generations Ifugao’s do not want to work in the farm anymore, so if it starts falling apart, they don’t know how to repair it. But despite of all of that, tourists still flock to see this wonderful work of mankind that never ceases to amaze. If you’re planning a trip to the Philippines, make sure to include the Banaue Rice Terraces in your itinerary. Hi Mandaragat I am from Banaue, better go in summer although I just had an email from my cousin that the weather really changed. It is rainy season in June. Anyway, we had been going home in July because of my son’s school and we had sunshine in the morning sometimes so you can still go if that’s the availble month you can take. Batad rice terraces is even better but you can only reach by foot if you are a good walker. There are places to stay the night in Batad as well. Another one is Bangaan rice terraces which is nearer than Batad and can be reach by transport and has a small restaurant. Have a nice time. Philippines Vacation and Philippines Travel. ©2006-2009 Market Junction LLC. All Rights Reserved. We appreciate any and all links to our home page or any content page you like. If you have a blog, feel free to talk about our content and link back to us. If you have any questions, please us our contact form. We are dedicated to bringing you great content about the Philippines. The Philippines are a magical place. We have reporters at the areas we discuss in Philippines Vacation. If you want to learn more about the Philippines or plan a trip to the Philippines, there's no better place to explore than Philippines Vacation. While you are enjoying Philippines Vacation, be sure to leave some comments! We enjoy comments from our readers. Don't be shy. Thank You for enjoying Philippines Vacation. Increase your website's search engine visibility by adding your link to this section for a small monthly fee. If you own a travel related website, a link on Philippines Vacation can boost your rankings and possibility of receiving targeted traffic. Interested in a link or advertising on Philippines Vacation?